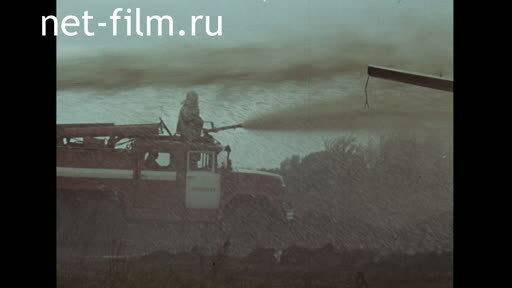 The film shows the work of emergency - rescue calculations on the ground. Fire trucks drove up to the burning plane. The types of the burning aircraft. Passengers boarding the plane, miom rides a fire truck patrolling the airfield. Fire truck with flashing blue light goes past standing on the airfield aircraft. View site rescue equipment to the airport and a plane taking off. Scheme of territory-based emergency services airport and transfer operational information to the services(animation). On duty at the communications dispatchers take calls. The plane on the runway starts to run,landing the plane. View of the hangar for fire trucks at the airport. On duty examines the binoculars airfield, the aircraft on the runway, a fire tower view of the airport. The duty of the fire brigade during the holidays, fire fighting equipment in the hangar on standby. A fire truck leaves the hangar, the planes are parked. Technology change one of the engines of the aircraft. Fire engine produces a detour of a place of repairing aircraft. A firefighter directs a water cannon to the scene of welding in the jet engine, welder at work. The plane on the runway, a hangar fire trucks. The burning aircraft during the fire drill. Check out the fire truck out of the hangar. Extinguish the fire using foam cannons. Fire truck driving on the airfield. The burning plane with foam gun, foam fills spilled on the ground burning fuel, the kind of devices to extinguish a fire. Foam filled section of the airport. Check out the fire brigades on alert. Fire trucks approaching the burning plane, the sight of the burning parts of the plane. A fireman in protective suit with a hose in hand putting out fire. To the aircraft approaching fire trucks and extinguish the fire with foam cannons. Firefighters work to extinguish the burning aircraft. Firefighters direct a hose on the fire, extinguishing the fire foam cannon. The firefighters face, the look of the hull and of the plane of the aircraft, filled with fire foam. The plane on the runway. Diagram of emergency evacuation in the hands of one of the passengers, the passengers in the cabin, opening exits with the descent of the inflatable emergency ladders during a school emergency. Passengers leave the cabin via the inflatable emergency ladders. The attendants at the communications of the emergency services of the airport, the transmission of the alarm signal. The fire Department dons protective suits and took places in the car. Check out fire engines from the hangar. To the place of accident leaves rescue equipment, duty of betraying information to the emergency services. Equipment of the emergency services travels to the victim of the accident aircraft. Firefighters put out the fire. On duty in the tower receives the signal. The scheme of interaction of the emergency departments in one of the emergency (animation). Burning of the landing gear. The burning landing gear, firefighters put out the fire, fill it with foam, firefighters face. General view of the aircraft on duty in the tower with binoculars. Fire trucks drove up to the plane, the form of a burning plane and fuel tanks. 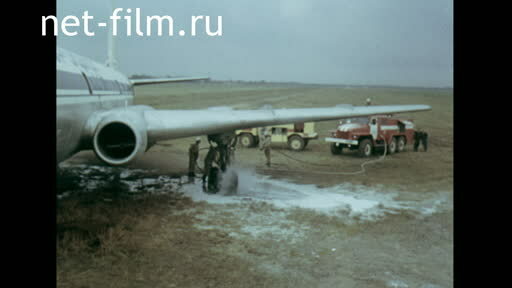 The process of extinguishing the fire, a fire engine and the burning plane with foam, the actions of the fire brigade. 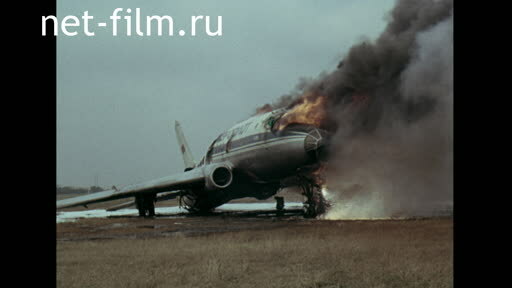 The kind of charred aircraft, the commander of the calculation reports on the radio about the fire suppression. The passengers in the cabin during the training and fire alarm. The crew members leave the aircraft and manually deploying the inflatable emergency slide. The stewardess gives the command to exit, the passengers leave the burning plane via the inflatable emergency ramp, running away from a dangerous place, fire truck rides. Firefighters climb on the plane, making their way into the cabin, stretch hose. The evacuation of the injured crew member, loading him in the car "Ambulance". General view of the burning aircraft, approaching fire trucks. The process of extinguishing the fire, the burning plane covered with foam, fragments of charred parts of the aircraft, firefighters face. Fire truck driving on the airfield, flashing blue light. The form of car emergency services of the airport, ready to emergency exit (top). The view of the runway.